The Xbox One X does what no console has done before: native 4K HDR gaming. However, while games look stunning – with a fantastic level of detail accentuated by the console's HDR support – their larger file sizes will mean that the 1TB hard drive fills up fast. Memory issues aside, the Xbox One X fulfills the promise of 4K HDR gaming and offers the most premium gaming experience on a console, bar none. The Xbox One X is the console of the future. Over a year on from its 2017 release date, it's still the most powerful gaming console on the planet, and stands to hold that title for the rest of the current console generation. But before you break out the charts, tell us about the lack of exclusives or inundate us with emails about how PS4 Pro is just as good as a console (we agree, it is), we have to first face facts: Under its hood, the Xbox One X packs an eight-core CPU, clocked at 2.3GHz, alongside 12GB of GDDR5 RAM. It also features a GPU clocked at 1172MHz, which gives you a huge 6 teraflops of graphical computing power. That's a lot of processing power for a console. The reason the Xbox One X needs it, however, is because it plays some titles in native 4K resolution – and sometimes at 60 frames per second. It's capable of HDR playback for games in the HDR10 format and supports Dolby Vision video streaming, too. For AV fans, this is the only platform where you'll find a 4K Blu-ray player built into the box and support for Dolby Atmos, a more immersive audio format than 7.1 surround sound. And yet, in spite of all of this, it's not perfect. The Xbox One X hard drive, which currently is locked at 1TB, fills up faster now that most games require 4K texture packs. Outside of Forza Horizon 4, State of Decay and Sea of Thieves, there were very few exclusives in 2018. And best/worst of all, you get a lot of the same functionality from the Xbox One S... which sells for around half the cost. For a look at what comes in the box check out our unboxing video below. All this isn’t said to shame the Microsoft fan base – in fact, for a certain type of gamer, the Xbox One X is still the greatest console ever made, in spite of its limitations. 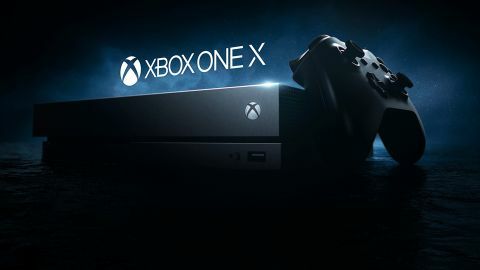 It’s just that, for most folks, the One X imposes a premium tax on a system that’s only marginally better in most ways than the Xbox One S.
The Xbox One X can play games in native 4K while the S only does upscaled 4K, sure, but Xbox One S does upscaled 4K so well that you might not even be able to notice a difference between the two. And, even if you could, is it enough to warrant the $200/£200 gap in price? The answer, well ... it depends. While we're inching closer than ever to an Xbox One X successor – just head to our Xbox Two page for more on that – we're likely another couple of years away from it being usurped. So are you someone you needs an Xbox One X, and needs one now? Read on for everything you need to make your choice. If you’ve seen an Xbox One S at some point, you should be able to picture the Xbox One X – if it weren’t for the difference in color schemes, the two consoles would be nearly identical. If you’ve never seen a One S before, the Xbox One X is a rectangular box the size of a large Blu-ray player that’s coated with a matte space grey color. It’s a far cry from the bulky VHS player-stylings of the original Xbox One, and the design only becomes more impressive when you consider what’s under the hood. The noticeable differences here between Microsoft's last console and its latest one (if you can even notice them) are the color change from the white sheen of the Xbox One S to the space grey of Xbox One X, and the shifting of the disc tray from the top-left side of the console’s face to sitting discreetly lower down the front. These changes are aesthetic, however, and neither add nor take away any functionality from the system... which isn’t a bad thing considering how well-equipped the Xbox One S was. A small shift in the location of the disc drive is the biggest design difference between the X and the S.
The aforementioned disc tray not only plays Xbox One games, but 4K Blu-rays as well. This might sound sort of mundane if you’re not totally up-to-date on what 4K Blu-rays are, but considering that Microsoft’s 4K consoles are the only ones on the market with that ability, you can understand why it’s worth pointing out. Round the back the similarities to the One S continue. From left to right you’ve got a power connector, HDMI out, HDMI in, two USB ports, an IR out, an Optical Audio port and an Ethernet port. To the surprise of no one, the console will not see the return of the original Xbox One's Kinect port – if you haven’t heard, Kinect (Microsoft's motion-sensing camera) is officially dead, and Microsoft has even stopped selling the adaptors that allowed it to work on modern consoles. Controller-wise the new machine is packing a new darker gamepad which, for all intents and purposes, is exactly the same mechanically as the one that currently ships with the Xbox One S. You can't fix what isn't broken, apparently. If controllers are a bit too imprecise for your liking, Xbox One X will support keyboard and mouse controls sometime in the near future. It's not the first console to do so (that award goes to the Dreamcast), but the feature will be welcomed by gamers who prefer this more accurate and responsive control scheme. Mechanically, it's the same old ergonomic Xbox One controller: but if it ain't broke, don't fix it. The console comes equipped with an eight-core CPU clocked at 2.3GHz, alongside 12GB of GDDR5 RAM. It features a GPU clocked at 1172MHz leaving the console with 6 teraflops of graphical computing power. The specs in the Xbox One X are pretty extensive, and should help usher in a new era of 4K HDR gaming in the living room. But before you jump on the PC Gamer forums to tell them how consoles have finally surpassed PCs in terms of value performance, just know that unlike a video card’s dedicated VRAM, the Xbox One X’s 12GB of RAM is split between the system and the GPU (i.e. you wouldn't be comparing apples to apples). On the CPU side, the Xbox One X is running a custom chip with eight Jaguar CPU cores clocked at 2.3GHz. That’s a 76% increase compared to the CPU inside the original Xbox One and Xbox One S, but probably only puts it in the ballpark of a current-gen Intel Core i3 processor (remember, however, that these numbers don’t translate to PCs very well). The Xbox One X's rear ports are identical to those on the Xbox One S.
The more important comparison for the Xbox One X specs, and the one Microsoft would rather you focus on, is those of the PS4 Pro. Sony’s system is a fairly competent competitor – its GPU has 36 compute units at 911Mhz that work in tandem with a 2.1GHz CPU and 8GB of GDDR5 memory. That memory runs into a bit of a bottleneck at the buffer, which is limited to 218GB/s, but it still puts out around 4 Tflops of performance. Point, Microsoft. Where the Xbox One X's specs falter is with the hard drive – a small 1TB drive that comes standard in every system. It’s also non-negotiable right now: we're yet to see a 2TB option break cover. This wouldn’t be such a huge sticking point if we knew Microsoft wasn’t capable of installing larger hard drives in its systems, but the existence of the 2TB Xbox One S proves that it is indeed possible and Microsoft willingly chose not to include one here. Of course, what’s the end-goal of all this extra horsepower if not a better gaming experience? Thankfully here we’re happy to report that the Xbox One X performs exactly as advertised: Games look great across the board. Whether you’re using a 1080p TV with the Xbox One X or playing in 4K HDR, games look fantastic on the next-gen console. But let’s break down each use case individually. If you’re a 1080p TV owner, the Xbox One X will do something called supersampling to create better-looking images. Supersampling is a complex term but the basic idea is that the game renders itself in 4K thinking it’s connected to a 4K screen, which means objects are rendered with four times the detail. All this data can’t be displayed, because at the end it’s still being shown on a 1080p TV with a set number of pixels on its display, but the resulting image is one that's more detail-rich. In practice that means images are going to look a bit sharper. Trees, branches and foliage in general won’t look so jagged, for example, and basic fog on an Xbox One might become thicker and more realistic while using an Xbox One X. Once you see a game running in 1080p with supersampling it’s very obvious that it looks better than a game running in standard 1080p. But if you’re not the kind of person who takes a minute to smell the roses in games – the kind who can appreciate a fine edge on a shrub or a rich, dense fog in the morning – then Xbox One X isn’t going to impress you. That is, unless you upgrade to a 4K HDR TV. Is the Xbox One X one for your TV cabinet? On a 4K HDR TV, the Xbox One X unleashes its full power. Games render at up to native 4K, offering offer four times the detail of regular 1080p. Better still, some of those games will have a wider array of color options thanks to a technology called high dynamic range or HDR. Skies look bluer, grass looks greener and colors drip from every scene. The results speak for themselves. But visual upgrades aren’t the only type of upgrades the Xbox One X offers. The other is performance – i.e. the frames per second at which a game runs. We’ll save you another long-winded explanation on the subject, but the basic idea here is that when scenes become really detail-rich and filled with a vast number of objects, the console becomes overwhelmed. Instead of being able to output, say, 60 frames per second, it drops down to 55 or even less. It was a big problem on the original Xbox One, but one that the Xbox One S seemed to do away with under all but the most extreme circumstances. Xbox One X tries its best to output games at 60 frames per second, a sort of golden number for the industry that matches the native refresh rate of most TVs and mainstream monitors. And while the results are noticeably better on Xbox One X, games still don’t always hit that 60 frames per second number – there are occasional dropped frames and slow downs. So what are you to make of all this? Well, Enhanced for Xbox games do look better on an Xbox One X console, whether you’re connected to a 1080p TV or not. Performance, also, is generally great on the new console. Games don’t run at a perfect 60 frames per second like you’ll find on mid- to high-end gaming PCs, but most of the time it’s great. Gears of War 4's graphics are elevated by the Xbox One X's 4K visuals. OK, Enhanced for Xbox One X games look great and play great. But what exactly makes a game Enhanced for Xbox One X? How many of these games are there? Microsoft itself hasn't set a minimum standard for what constitutes an Enhanced for Xbox One X title but there are three broad categories that developers are using: enhanced 4K visual assets, HDR visual processing or higher frame rate. And just one of three will suffice. To that point, it’s possible for a game to offer HDR or a 60 frames-per-second framerate, but not native 4K and vice versa. Developers can pick and choose which enhancements make sense for their games and roll with it. To make matters all the more complicated, Microsoft’s Xbox Chief, Phil Spencer, has gone on record saying that new games aren’t necessarily required to support the new hardware, i.e. there’s no mandate for developers to take advantage of the Xbox One X’s capabilities. All of this would be more upsetting if developers didn't embrace the Xbox One X like they have - but, thankfully, that hasn't happened. These days, most games that are released have an Enhanced version associated with them. And that means there's plenty to play on your Xbox One X. Before we close out the review, we thought it'd be a good idea to examine the interface for the Xbox One, that ever-changing software that is somehow still so divisive now three years and two major updates after launch. If you’ve yet to download it on your Xbox One at home, the new Xbox One interface is a sort of mash-up of the Xbox 360 blade design and the Windows 10 block-and-pin-heavy design. Like the blade design of yore, the interface is separated by purpose: there’s Home and Store tabs, which are pretty self-explanatory, but also tabs for Community, Entertainment and Mixer, a Microsoft-owned Twitch competitor. Navigating from one tab to the next is a fast and fluid experience and, to its credit, there’s always something new to look at. One of its most unique features is turning the idea of pins – games or apps that you are really attached to – into full rows on the Home screen. This row might call attention to DLC, note how close you are to a particular achievement or show you a highlight from Mixer. It’s a novel way to keep you thinking about a game long after you quit out and something we found ourselves appreciating every time we saw it. Using the Xbox One UI is fluid and well-organized. For gamers who can afford it, the Xbox One X is the pinnacle of console gaming. Coming into this final review we had some concerns. We thought Microsoft’s most premium console yet might not provide anything of value to the 1080p TV owners out there. We felt that its performance, however good, might not be able to justify its price. And we were scared that games might not get patches for long stretches of time, leaving Xbox One X owners without way of showcasing their hardware. On all accounts, we were wrong. As it turns out, the Xbox One X is a premium console through and through. Sure, you might need a discerning eye to spot the differences between supersampled games in 1080p and games played in 1080p on the original Xbox One, but there is a difference. With 4K HDR gaming, however, the proof is in the pudding so to speak. When hooked up to a decent 4K HDR screen, the console plays games at an astoundingly high level of detail. Throw on a 4K Blu-ray with Dolby Atmos sound, and you’ll be treated to the best cinematic experience this side of movie theater. But while the Xbox One X has claimed the new top spot, its closest competitors – the PlayStation 4 Pro and Xbox One S – aren’t far behind. Despite not being able to play games in native 4K, these consoles are around half the price and look nearly as good. Their better balance between affordability and performance will make them a better pick for the vast majority of gamers out there, save for the few who see and appreciate the minor differences in premium, high-octane video quality and lower grade, but-still-awesome upscaled 4K. Even if neither of these consoles had never existed, however, the Xbox One X wouldn’t be flawless. Its 1TB hard drive could theoretically fill up almost overnight thanks to 100GB-plus downloads for games like Gears of War 4, Forza Motorsport 7 and Quantum Break, if it weren’t for the fact that these massive games will take several hours to download. Microsoft could fix this down the road with a larger size hard drive but, as it stands right now, the world’s most premium console can only store around 10 triple-A games at a time. At the start of this review, we said there was a specific type of gamer the Xbox One X's sheer horsepower was designed for. Having read through our review, you're best placed to decide whether or not that gamer is you – or, to put it another way, whether you think you'd appreciate and make use of the extra processing heft and graphical improvements the Xbox One X offers. If you’re the kind of gamer who stops to look at the scenic vistas, or a streamer who can point out a 4 frame-per-second difference while looking at two videos side by side, the Xbox One X is a worthwhile investment. That said, if you’re a gamer who just wants a console that plays great-looking games without digging too deep into your pocket books, the Xbox One X is a bit overkill. Save some money and buy yourself an Xbox One S... preferably the one with a 2TB hard drive. To compare prices and score the best saving on an Xbox One X in Australia, head over to our sister site Getprice! Original review published at 12:01 PST on November 3, 2017. Jon Porter contributed to this review.